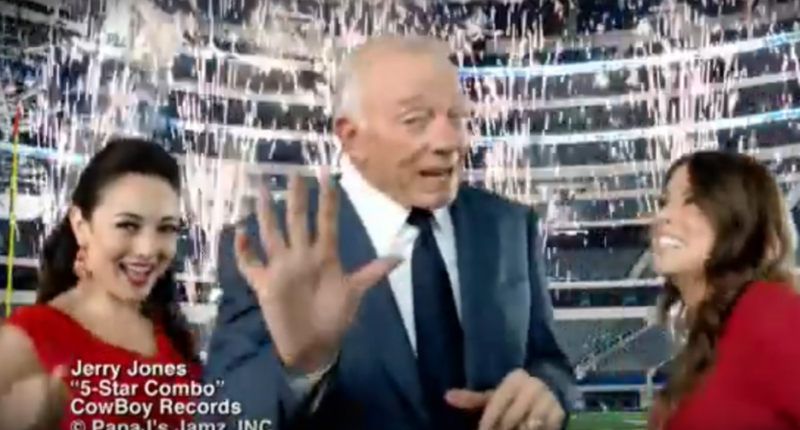 Was Jerry Jones behind Papa John's protest comments? Was Jerry Jones, Papa John’s second-largest stakeholder, behind John Schnatter’s protest comments? Jones owns over 100 Papa John's franchises, and has reportedly been trying to block Roger Goodell's extension. Having Papa John's CEO John Schnatter criticize Goodell's leadership might help there. Papa John’s founder and CEO John Schnatter went off on the NFL over protests Wednesday, even pulling some of his ads, and making a lot of headlines in the process for comments like “The NFL has hurt us,” “Leadership starts at the top and this is an example of poor leadership,” and “This should have been nipped in the bud a year and a half ago.” Now, there’s some speculation that Schnatter’s comments may have been motivated by his chain’s second-largest stakeholder, Dallas Cowboys owner Jerry Jones. Jones has become a significant Papa John’s franchise owner, with the total number of stores owned by Jones in excess of 100 as of 2014. The relationship started in 2004, when Papa John’s became the official pizza of the Cowboys, and in turn Jones acquired 49-percent interest in 71 Papa John’s stores. Eight years later, Jones appeared in a Papa John’s commercial, where he rapped through the whole thing. More recently, Jones has been doing a different kind of rapping as he tries to derail the Commissioner’s contract extension, which the Compensation Committee already has been authorized, by a 32-0 vote back in May, to execute. The suspicion in some league circles is that Jones, who has reason to be even more upset with Commissioner Roger Goodell now that running back Ezekiel Elliott‘s suspension is back on, instigated Papa John’s CEO John Schnatter to use Wednesday’s quarterly earnings conference call to dump on the NFL, and to call out NFL leadership for failing to solve the anthem issue before it became a full-blown problem. For that reason, look for the league office to take Schnatter’s complaints with a grain of salt. This idea of Jones being behind Schnatter’s comments also makes some sense. It would be quite Machiavellian for Jones to have someone publicly criticize the NFL, an organization he’s very much a part of, in order to try and push out Goodell, but it’s also somewhat reasonable given what’s been reported about Jones’ opposition to a Goodell extension and given some of Jones’ tactics in the past. And on that front, it’s notable how much Schnatter focused on Goodell, with “leadership starts at the top and this is an example of poor leadership.” Just complaining about NFL ratings declining and controversy for league sponsors thanks to protests would have been one thing, but Schnatter made his comments a very pointed criticism of Goodell, which would certainly would appear to serve Jones’ agenda. Of course, correlation isn’t causation, and just because Jones is involved with Papa John’s doesn’t mean he’s telling Schnatter what to say. It could be Schnatter was already upset with Goodell and the NFL (especially considering that his company’s paying millions for the leaguewide sponsorship) and did this on his own. From a cynical perspective, too, Schnatter’s comments may have been a way of shifting the focus away from his own company’s poor performance, especially as Pizza Hut and Dominos aren’t citing any NFL impact. They’re certainly an interesting change of tone considering how recently (last year) Papa John’s was praising the NFL and their sponsorship deal. But, if the goal was to have a big corporate executive publicly blast Goodell, mission accomplished.